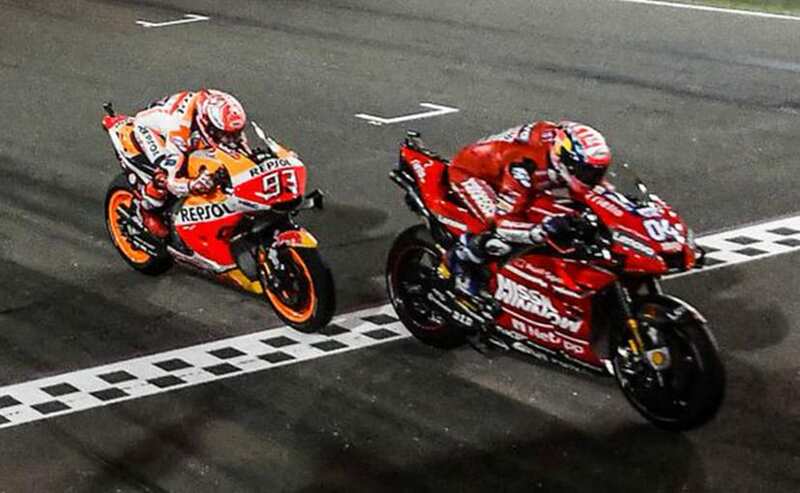 Ducati's Andrea Dovizioso edged past reigning world champion Marc Marquez of Honda by 0.023s to win the 2019 MotoGP season opener - Qatar GP. In a deja vu of sorts, the 2019 MotoGP season started with the same visual as 2018 with Ducati's Andrea Dovizioso winning the season opener at Qatar. The Ducati rider won the Qatar GP by a hair's length over reigning world champion Marc Marquez of Honda finishing second 0.023s behind. The Qatar GP was at its dramatic best with LCR Honda's Cal Crutchlow taking the last spot on the podium, reiterating the MotoGP remains as unpredictable as ever for the rest of the season. The race started with Yamaha's Maverick Vinales on pole followed by Dovizioso and Marquez at P2 and P3. Dovi had the best start to the race and was quick to take the lead, and was followed by a 10-rider pack for the early stages of the race. By Lap 5, Suzuki's Alex Rins moved up the order and passed Dovizioso only to hold on to the lead for a brief period. The top two riders battled for the top spot over the next six laps, until the Ducati moved back in the lead on Lap 11, with the Suzuki rider dropping to fourth after running wide, behind Crutchlow. The battle was back between the Honda and the Ducati, while Danilo Petrucci was running third ahead of Rins. By Lap 15, the Suzuki rider was back contending for second against Marquez and passed the Honda only to hand the position back to the rider after outbraking himself on Turn 1. That left Marquez and Dovizioso to battle for victory and the former did take the lead on the penultimate lap as he passed Dovi on the Turn 4. However, the Ducati rider clearly had set his sight on the chequered flag first and managed to retake the lead on the final lap at Turn 10. Despite Marc's push on the final corner, the Honda rider couldn't pass the leader and settled for the second place at the Losail circuit. Coming in third was Crutchlow after passing Rins on Lap 20 and held on to the position till the end of the race. Meanwhile, Valentino Rossi made a stellar finish in fifth place having started way back in 14th position. The Italian moved up the order in the early stages of the race and then progressively passed a number of riders including Ducati's. Danilo Petrucci, teammate Vinales who dropped to P7 on the opening lap and held on to the position. Suzuki rider Joan Mir took eighth followed by Takaaki Nakagami of LCR Honda and Aleix Espargaro of Aprilia rounding up the top 10 list. Franco Morbidelli of the new Petronas Yamaha team finished 11th, with KTM's Pol Espargaro taking 12th. Coming in 13th was Jorge Lorenzo making his Honda debut and started a distant 15th, after crashing in qualifying. The final points were picked up by Andrea Iannone of Aprilia and Johann Zarco, both making their respective debuts with teams this season. Aprilia's wild card Bradley Smith was the only crash in the race, while Pramac Ducati riders Franseco Bagnaia and Jack Miller pulled in the pits to retire.